Strong women characters are showing up everywhere, on the stage, on the screen, and on the streets. With them they promote freedom, justice, and hope for the future. 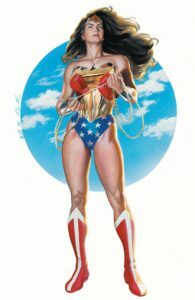 Therefore, I went, with friends, to see this newest offering of DC Comics iconic Wonder Woman. This superhero movie was enjoyable from beginning to end. Little girls all over the planet have a new role model of courage and strength to epitomize. Stay tuned for more Wonder Woman facts next week! The arts can be counted on to keep the human spirit alive and hopeful. Throughout history, it has been through art that healing can be found. Some of our most revered political and military leaders also found their solace with painting, music, poetry. It’s good for the soul! How do you keep your spirit healthy? Watching Wonder Woman was good for mine. 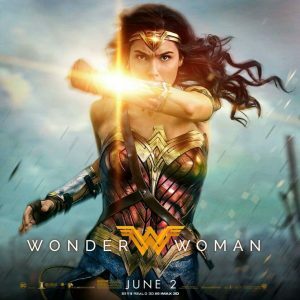 Wonder Woman has broken records in its opening weekend, bringing in over $100 million at the domestic box office. 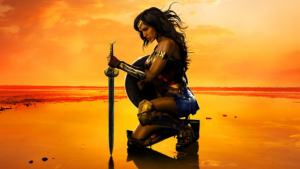 The most famous female superhero, who made her comic book debut in 1941, has been waiting for her close up in a feature film for over 75 years. Wonder Woman was created for DC Comics in 1941 by Dr. William Marston. The female superhero was developed as a response to critics of comic books who said the characters were too violent. Marston based the Wonder Woman on the emerging feminist ideals of the time, showing the strength and power of women while also keeping their allure and beauty in mind. Hi! I could have sworn I’ve visited your blog before but after browsing through many of the posts I realized it’s new to me. Anyways, I’m certainly happy I stumbled upon it and I’ll be book-marking it and checking back regularly! Glad you found me. A labor of love to help stay positive in a negative world. Certainly have found lots of inspirations from current events. Always open to feedback too. I just want to say I am just beginner to blogging and seriously liked your website. More than likely I’m likely to bookmark your blog . You definitely have very good writings. Many thanks for revealing your website page. I simply want to tell you that I’m newbie to weblog and honestly loved you’re web blog. Likely I’m want to bookmark your website . You actually come with fabulous well written articles. Thank you for sharing with us your blog site. I am now not positive the place you are getting your information, but good topic. I needs to spend some time studying much more or working out more. Thanks for magnificent info I was searching for this information for my mission. Great tremendous issues here. I am very satisfied to look your post. Thank you so much and i am having a look ahead to contact you. Will you kindly drop me a mail? I am really enjoying the theme/design of your web site. Do you ever run into any web browser compatibility issues? A couple of my blog visitors have complained about my site not working correctly in Explorer but looks great in Safari. Do you have any suggestions to help fix this problem? Depends on the browsers used. Most find my site okay, but a couple are troublesome. My wife and i got very thrilled when Michael managed to carry out his inquiry through the entire precious recommendations he grabbed when using the blog. It is now and again perplexing to just be giving freely ideas that many others may have been selling. We really take into account we’ve got you to thank for that. Those explanations you made, the easy website navigation, the friendships you make it possible to create – it’s got everything astounding, and it’s really making our son and the family consider that that situation is brilliant, and that is especially mandatory. Thanks for all! whoah this blog is fantastic i like reading your articles. Keep up the great work! You recognize, many individuals are hunting around for this info, you can aid them greatly. Howdy very cool blog!! Guy .. Excellent .. Superb .. I’ll bookmark your blog and take the feeds also¡KI am glad to find a lot of helpful info here within the put up, we’d like work out more strategies in this regard, thank you for sharing. . . . . .
With havin so much written content do you ever run into any issues of plagorism or copyright violation? My website has a lot of unique content I’ve either written myself or outsourced but it looks like a lot of it is popping it up all over the web without my permission. Do you know any methods to help prevent content from being stolen? I’d definitely appreciate it. Hullo here, just got conscious of your blogging site through Search engines like google, and discovered that it is quite educational. I will appreciate should you decide retain this approach. Hiya there, just became mindful of your web page through Yahoo and bing, and discovered that it is genuinely informative. I will take pleasure in if you continue on these. Hi here, just became aware about your webpage through Yahoo and bing, and found that it is really entertaining. I will like in the event you maintain this informative article. Normally I don’t read post on blogs, but I would like to say that this write-up very compelled me to take a look at and do it! Your writing taste has been amazed me. Thank you, quite great post. Hiya very cool website!! Guy .. Beautiful .. Superb .. I’ll bookmark your site and take the feeds also…I am satisfied to find a lot of helpful information right here in the publish, we need work out more strategies on this regard, thanks for sharing. Some really nice and useful information on this internet site, likewise I think the style has got superb features. Simply wish to say your article is as astounding. The clarity in your post is just excellent and i can assume you are an expert on this subject. Fine with your permission allow me to grab your RSS feed to keep up to date with forthcoming post. Thanks a million and please continue the enjoyable work. I conceive this internet site contains some very superb info for everyone :D. “Believe those who are seeking the truth doubt those who find it.” by Andre Gide. I just want to mention I am just very new to blogging and site-building and honestly loved you’re blog site. Almost certainly I’m planning to bookmark your site . You amazingly come with very good well written articles. Thanks a bunch for sharing with us your website. I simply want to mention I am very new to blogging and site-building and seriously savored your blog site. Probably I’m planning to bookmark your blog . You actually have fantastic stories. Appreciate it for revealing your web page. I simply want to tell you that I am all new to blogging and site-building and seriously enjoyed you’re web-site. Almost certainly I’m planning to bookmark your blog . You surely come with incredible article content. Thanks for sharing your web page. I would like to thnkx for the efforts you have put in writing this blog. I am hoping the same high-grade web site post from you in the upcoming as well. In fact your creative writing abilities has inspired me to get my own blog now. Really the blogging is spreading its wings fast. Your write up is a good example of it. Thanks so much for giving everyone an extraordinarily terrific possiblity to read critical reviews from this web site. It’s always very fantastic plus packed with fun for me personally and my office colleagues to visit the blog at a minimum 3 times weekly to learn the newest things you will have. And definitely, I am at all times motivated with your sensational techniques you serve. Selected 4 tips in this posting are unquestionably the finest we have had.